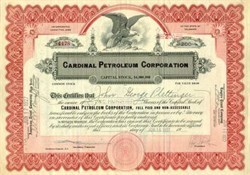 Beautifully engraved Stock Certificate from the Cardinal Petroleum Corporation issued during 1926 - 1928. for shares of common stock. This item has an ornate border around it with a vignette of an eagle pearched on top of a mountain. The historic certificate has the hand signature of the company's president, J.E. Stock and is over 73 years old.